Scroll down to find the final word on my treasure map and complete the short story. And now, in your adventure sailing the seven oceans of the wild internet, you've found another treasure, me hearty. The code is hidden in the pirate's map. Now you'll want to sail over to author #94, Lindsey Loucks for the next clue. When you've put all the words together (in order from 1 ~ 140) you'll be able to reconstruct the “Secret Legend". and enter the grand prize here. Good Luck, me hearty! I hope you win (because you're my special favorite reader)! 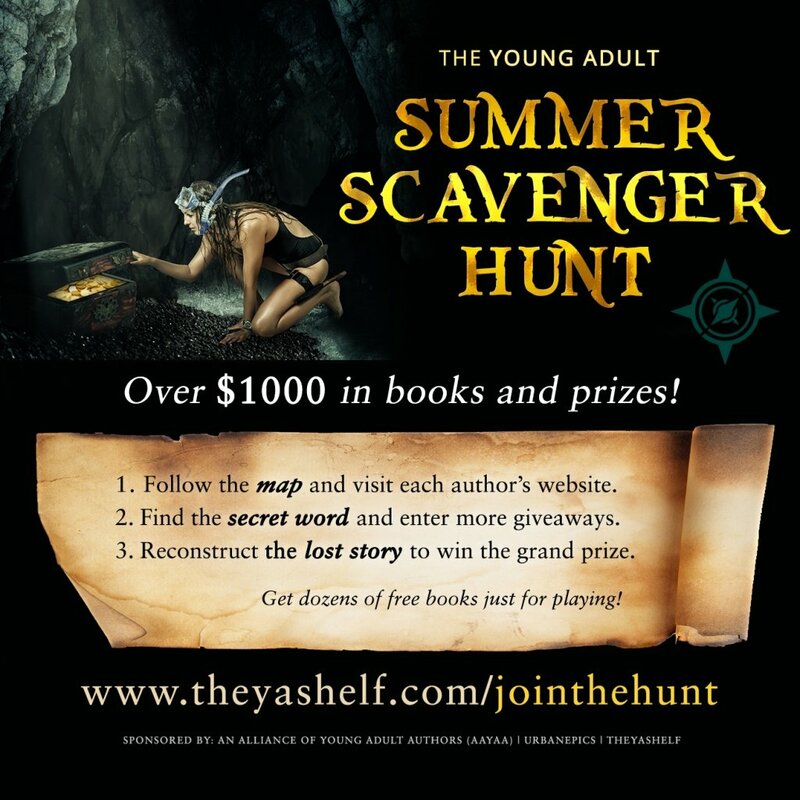 In June, the Alliance of Young Adult Authors is sponsoring a massive young adult scavenger hunt. This is a chance to meet some new authors, grab a bunch of free books, and sign up to win a whole bunch of epic prizes! In addition to the $500 grand prize, each author will be hosting great individual giveaways. 1. Each author will be given a special keyword, which will be bolded and all caps like this: BUTTERFLIES. 2. All you have to do is visit all the author’s sites in the order listed below, write down the special keywords to discover the short story, then enter the giveaway with the completed short story HERE (link will be posted soon). 3. There will be one main giveaway for the main prize, but most of the participating authors will also have smaller giveaways, so make sure you read their post carefully to see what else they’re offering while you’re on their site for the keyword. 4. When the scavenger hunt begins (June 1st) all you have to do is visit each site below in order and write down the special word to reconstruct the story. You can enter any of the giveaways or offers on anybody’s site, or just grab the special word and move on. I’ll add a link soon where you can enter for the grand prize when you have the full story. "So where do you get your characters' names from?" That's a question most authors are asked at some time, and I don't think there's a single answer because it varies enormously from writer to writer. I was once at an author event where crime and thriller writers Mike Nicol and John Connolly were also asked this question. Nicol said he ponders the issue for months, determined to come up with a name that is the perfect fit for a character, while Connolly (looking frankly amazed at this answer) said he opens the phone books and stabs with pen! Personally, I'm very careful when it comes to choosing my names. I have a well-thumbed baby names book to stimulate ideas and to research name meanings, and I regularly scan the online baby name and surname sites. I like to leave "Easter eggs" in my books for readers who make an extra effort, and so you'll usually find that the names of my main characters (and villains) have some kind of meaning. In my most recent book, Hushed, I named the heroine Romy. This is a contraction of Rosemary, which means 'dew of the sea' - a most appropriate name for a character (loosely) based on The Little Mermaid (who, in the original story, actually dashes herself into the ocean and turns into sea foam!). Her surname is Morgan ('dwells near the sea / of the sea / defender of the sea'). Her sisters all have sea names, too: Meriel ('bright sea'); Genna ('white wave'); Marina ('of the sea'); Cordelia ('daughter of the sea', also the only daughter in King Lear who was loyal to her father, which fits this character in Hushed). Their father is called Rex ('King' because he's the modern version of Poseidon, the kind of the sea) and the Russian ice-breaker turned anti-whaling ship is called Syrenka - a twist on the Polish Syrena, meaning 'mermaid'. I named the hero Logan mostly because I really liked the name, but also the meaning ('dweller from a little hollow') has significance for something we learn about him during the course of the book. In Scarred, my courageous heroine is Sloane ('warrior'), and the hero who helps her accept and forgive herself is Luke ('light-giver', with connotations of healing from the New Testament physician disciple). In the Recoil Trilogy, my expert sniper protagonist is called Jinxy ('magic charm', plus she turns out to be a jinx for those who try to exploit her! ); and her intel expert and hot braniac love interest is named Quinn ('wisdom, reason, intelligence'). Nomusa (one of the three main characters in my Eco-warriors series) got her name in an unusual way. I was desperately trying to find accommodation for a long weekend away in the ukhahlamba Drakensberg mountain range (where thew books are set) and everything was booked solid, but then an amazingly sweet and helpful call-center operator lived up to her name, Nomusa (which means 'merciful' in Ndebele) and found me a cabin! I knew at once that I'd found the perfect name for the kind, empathic, compassionate character in the books. In the same books, the headmistress is named Lilith Grieve (a 'female demon and night monster') so you just know she's going to cause you grief and be of no help to the eco-warriors! I don't always choose the moniker based on its meaning, though. I ran a contest to name one of my favorite characters in Refuse and Rebel - that's how Miss Tallulah got her name! And sometimes, characters "grow into" their names. When I was writing Scarred, I stuck the name Eileen in as a placeholder for the name of the psychologist Sloan has therapy with. Eileen is the name of a good friend of mine who is also a psychologist in real life, so her name just popped into my head when I was writing. The character isn't based on her, and I fully intended to go back and change it, but gradually the name seemed to fit the character more and more, and so I wound up leaving it in. I named Dan in the eco-warrior series because he seemed to be as funny, cute and cheeky as Daniel Radcliffe (who plays Harry Potter in the movies). Sometimes family gets a mention - two of the triplets in Scarred (Devon and Keagan) arte named after my nephews, Nicki (Refuse) has the name of one of my sisters, and the generous English couple who donate to Sam's anti-fracking fund in Fault Lines have my other sister's surname. I am not above naming characters from a revenge motivation, either! The name of the evil, tormenting science teacher in my eco-warriors series, for example, is a twisted version of the name of the deeply unpleasant science teacher I had at school! (Ah, sweet revenge!). Fair warning - don't annoy a writer unless you want a rotten character named after you, LOL. I'm curious to know - do you ever look up the names of the characters in the books you read? If you had to name a hero/ine or a villian, what would you call them? I'm delighted to announce the release of my 11th novel! Get your copy at Amazon here and the paperback here. - And on Friday 19 May, I'll be head-shrinking Harry Potter in a talk entitled, Harry On the Couch - which I once presented at an awesome Harry Potter conference in New Orleans, back in 2007, two months before the release of Deathly Hallows. The festival is always a tonic - an immersion in words, wine and gastronomy in one of the most beautiful towns in the world. See you there?